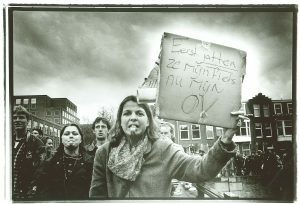 The LSVb was founded in 1983 in Delft, but the history of student union formation goes back further. In 1963, the Dutch Student Movement (Studentenvakbeweging, SVB, in Dutch) was founded. This initiative followed the example of the French Union Nationale des Étudiants Français. In those years, the SVB is strongly committed to tuition reimbursement and other material advocacy for the student. As the 60s progress, the SVB polarises and becomes more left oriented. In 1968 large student riots take place in France. Initially, things remain calm in the Netherlands, but a year later the famous occupation of the Maagdenhuis takes place. Shortly after this, the SVB goes down in further radicalisation. In 1971, the National Consultative Board (Dutch: Landelijk Overleg Grondraden, LOG) was founded. The LOG is partially represented by the same clubs within the SVB and may thus be considered as a kind of re-launch.